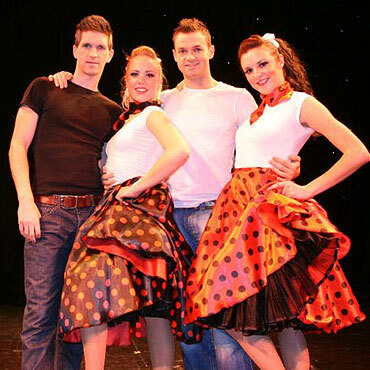 Our Jive dancers perform high-energy routines, complete with impressive lifts and tricks, set to classic Rock n Roll hits of the 1950’s. Perfect for themed parties and Prom nights, our Jive couples can also recreate scenes from the hit movie Grease, including the iconic Hand Jive, Greased Lightening and We Go Together. After their performances, our dancers can invite guests on to the dance floor and can even teach a fun class to learn some basic Jive steps. If you are looking for a performance with an added element of surprise, check out our Jive Dancing Waiters!